Nigerians have been told to expose those engaging in vote buying and get rewarded by the EFCC. As part of collaboration for successful elections, the Economic and Financial Crimes Commission (EFCC) has warned against votes buying ahead of Saturday’s presidential elections. 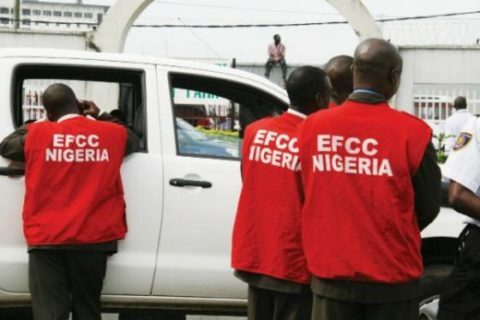 The EFCC has also promised reward for any Nigerian with useful information leading to the arrest of culprits, saying that the reward is in accordance with the Whistle Blowing policy. The Acting Chairman of the EFCC, Mr Ibrahim Magu, has repeatedly warned against voter’s inducement, saying that the full weight of the relevant laws will be applied against perpetrators and receivers of illicit funds to undermine the elections and its national security. “We wish to warn Nigerians against those who intend to engage in voter’s inducement. “There are existing laws in the Electoral Act, 2010 (EA), which forbid voters inducement. “For the avoidance of doubt, Section 124 of the Electoral Act, 2010 says that any person paying money to electorates as bribe at any election is liable to punishment of N500, 000 fine or 12 months imprisonment or both upon conviction. “Section 124 of the Electoral Act, 2010 also states that any person receiving any money or gift for voting or to refrain from voting at any election will be liable to a maximum fine of N500, 000 or 12 months imprisonment or both. “We also seize this opportunity to state that that EFCC in collaboration with INEC will reward any patriotic citizen that provides authentic information leading to the apprehension of any culprit of vote buying in accordance with the Whistle Blowing Policy. “It is our collective duty to resist attempts to corrupt our electoral process by exposing the evil perpetrators”, Magu said.